One of the most important things to bring on your trip to Disney World or Disneyland is a good pair of walking shoes. The best shoes for Disney are ones that are comfortable and allow your feet to breath and expand without pinching or causing blisters. Did you know that the average park guest walks 10 miles per day at the Disney parks? That is a TON of walking. And when you think that you will probably be at the parks for more than one day, you are going to want to make sure that you have shoes that will go the distance. The last thing you want is for your trip to the parks to be ruined by blisters or sore feet. I’ve tried many different types of shoes on our trips to the parks, but I finally think I’ve found the best shoes for Disney. The most comfortable shoe to wear to Disney are Skecher GoWalks. Skechers are leaders in the walking shoe industry and it is easy to see why. They know how to make a great lightweight walking shoe that can go for miles! They are slip-ons. This means that you don’t have to worry with laces coming undone while you are in the parks. Breathable Mesh Fabric that dries quickly. You will want a shoe that breathes when you are walking on hot pavement all day. It’s also a nice bonus to have a shoe that dries fast after those afternoon Florida showers! Memory Form fit. This shoe molds to your foot. That means that it allow pressure to distribute naturally. Resalyte Midsole helps cushion impact. With all of the walking you will do at Disney, having a midsole that absorbs impact will help your knees. Multi directional traction sole. No one wants to worry about slipping or tripping at the parks. The fact that the Skecher GoWalk soles have proper traction means that you will have better footing no matter what kind of surface you walk on. Super Lightweight. When you are walking, you will appreciate not having a heavy sneakers on your feet. Skechers GoWalk shoes are not only comfortable, they are stylish and come in a vast array of colors and styles! That is probably why I have three different pairs. These shoes are so much my favorite that they were the only walking shoe I brought and wore on our Disney Cruise to the Mediterranean last summer. Seriously, these are the best walking shoes ever. 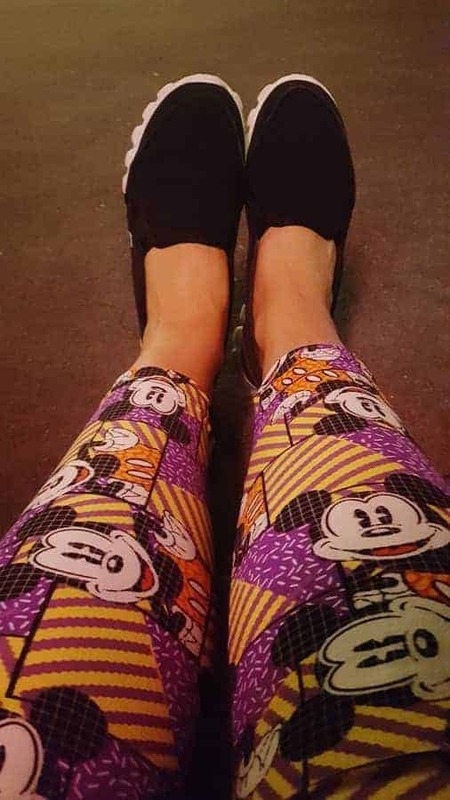 Next time you are at Disney, take a look at the feet of the people around you. I have no doubt that you will notice that many of them are wearing Skecher GoWalks because they know what I do, that these are best shoes for Disney! What do you think are the most comfortable shoes to wear to Disney? Find our what our top pick are for which shoes kids should wear to Disney. I wear the Skechers H2GO shoes. You can even wear in the rain, and comfy for your feet! I haven’t tried to H2GO yet. Love that you can wear them in the rain! Reef Slap flip flops work best for me! I couldn’t agree more – Sketchers Go Walks are the absolute best!!! I just got back from Disney and after being on my feet all day from 7:30 AM until midnight my feet were the ONLY thing on my body that didn’t hurt! Lol! Do you wear socks with them? No. You could, but most don’t. I must agree. After visiting Disney at least every spring and fall since 2003, we joined the D.V.C. in 2006. That’s alot of trips. I have tried flip flops, old school tennis shoes, ballet flats, and sandals (even boots in the winter). I must say that after all these trips I finally realized instead of hauling my back up pair of shoes in my bag, (my group doesn’t stop), I could rent a locker and not break my neck and arm hauling that bag. 2 years ago, my sister in law had bragged on her Skechers Go Walk. To tell the truth, I was reluctant, because as a mom of 2 boys, I thought they were kid shoes, ugly, and might light up as you walk. So I tried hers on one day. AAAAAAHHHHH, I heard angels singing. They were wonderful. I bought 3 pairs immediately. We travelled to Disney for spring break with our family 2 years ago, and I took them and a back up pair of flip flops just in case. (I had a major repair to my right knee months before). So I major league had reasons for needed comfort. I now own about 6 pair. They are THE best. I like to be on trend. So I at least have enough colors to match my cute outfit. They deserve a 10 out of 10 rating, I never changed shoes during the day at the park, once the entire week. That was such a delightful relief. I know what you mean. I have three pair and am getting ready to order a 4th! They are always coming out with new colors which makes it fun. FIT FLOPS. not flip flops, but FIT FLOPS. that’s the brand.!!!! I’VE worn them every single year and we stay at the parks until midnight for four days in a row. the FIT FLOPS are AMAZING! I have never had tired feet or legs, EVER! and on a regular day at home, in regular shoes, my feet are killing me so to be on my feet for 12 hours in the parks says a lot! I have never heard of Fit Flops but I will have to check them out! Fit Flops completely cured my plantar fasciitis. They were recommended by my podiatrist 6 years ago and I won’t wear anything else in the summer. I have the sketches this post is about. They don’t hold a candle to Fit Flops! I keep hearing about these FitFlops. I will have to try them out. I have to agree with the skechers go walk 3 i never get tired. last trip i went with my teenage son and he likes to sig sag all over the park…ugh. bought the go walk 3 shoes and put them on straight out of the box, heading to the airport. and wore them for 8 days straight!!! no blisters, no tired feet, and my hips and knees didn’t hurt like usual. wow!!! i swear by these. i now have 3 pair and a brand new pair ordered for our next trip whenever that may be. i like the go walk 3 better then the 4 because of the roominess of the toe box. these will NOT disappoint. Do you wear them with or without socks while in the parks? I’m trying to find Comfortable walking shoes or flip flops why 14 urbold son will actually agree to wear in Disneyworld. I could never get him to wear Crocs. Suggestions??? Do you wear socks with them while doing a lot of walking? For Disney all season (we took our coldest this month trip and they were still just fine!) are the Keen Venice Sandels… cover your toes, the footbed is phenomenal, and they are all weather. 4 trips in 6 years with the same Keen’s, and they have been the BEST shoe! I read a ton of reviews on Amazon recommending them for Disney, of all things for a shoe review! I bought them for the whole family! No one get blisters! I love KEENS and they are our choice for Kids to Shoes to Wear to Disney. I may have to try a pair for myself! I usually wear my shoes a week prior, but these NEVER cause me blisters no matter when I wear them. I just bought a pair of Tevas for this summer, and looking ahead to Disney next spring. I have tried on the sketcher gowalks. They were pretty comfy. I may pick up a pair. But, I used to get some sketcher sandals which are similar to one that they still sell online. They are called Sketchers D’lite. They have neoprene upper thongs, yoga mat or memory foam supports, and a giant supportive walking shoe bottom. They have never given me anything but happy feet at the happiest place on earth. I used to think that they were super cute, but now the look may be slightly outdated. But, they don’t leave any sores or sore feet. I am getting close to forty and have fibromyalgia. Just the past few months I have decided to live for comfort and support. These are amazing for that. Even if they have an old school Sketchers look.